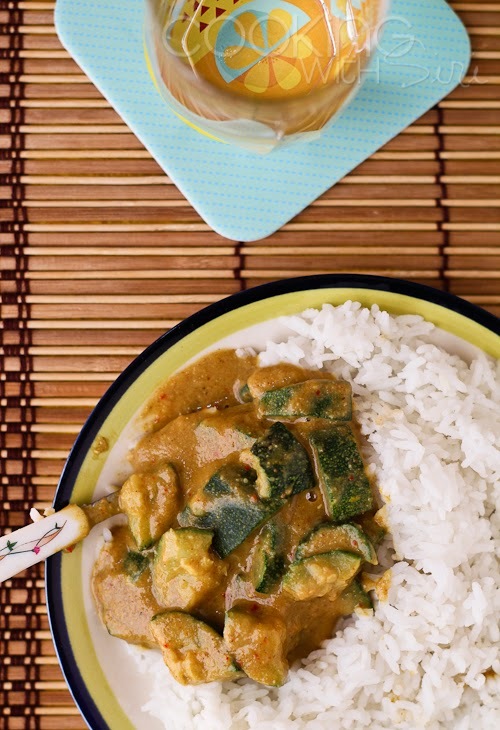 Piping hot dal + white rice (chawal) is a combination made in heaven. 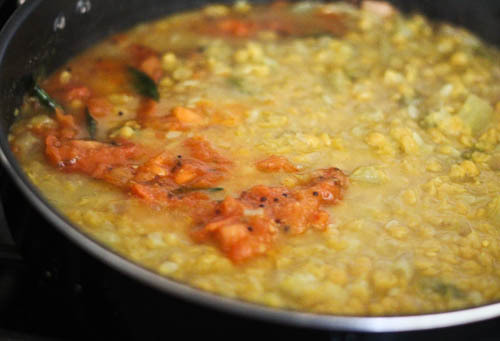 There are numerous ways to prepare a dal in Indian cuisine incorporating different kinds of veggies and spices. 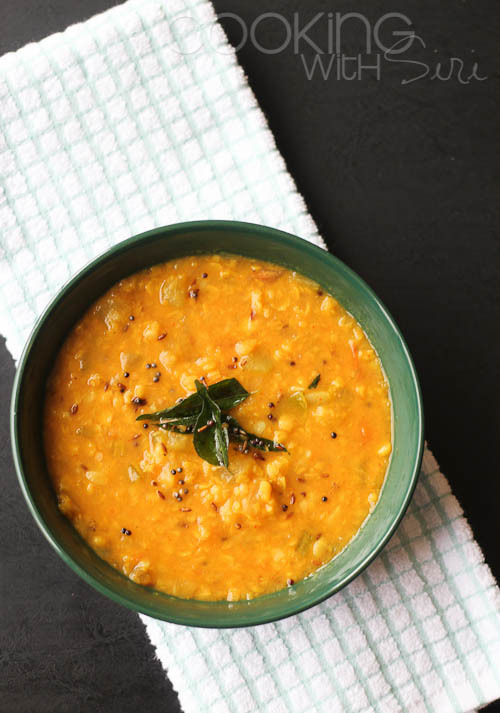 Today's recipe - Lauki Chana Dal (Bottle Gourd Cooked in Lentils) uses split bengal gram, bottle gourd also known as opo squash and my handy, best friend in the kitchen - a pressure cooker. I know it is one of those cooking equipments with a bad rep but it is making a comeback thankfully with many fool-proof, safety features. Did you know when compared to conventional cooking, most foods cook 70% faster (here's the proof) when using a pressure cooker. No wonder I love it so much especially on crazy weekdays when whipping up a simple meal seems like a big chore. Food taste better too, don't you think with all the aromatics, juices and nutrients trapped inside the pot. 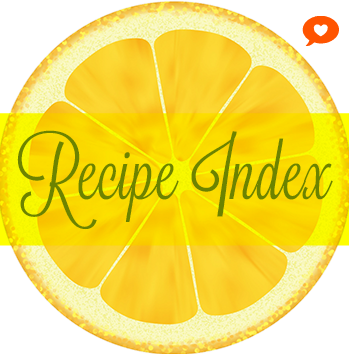 If you don't have one already, I would highly recommend it and there are tons of delicious recipes that you can make in minutes. 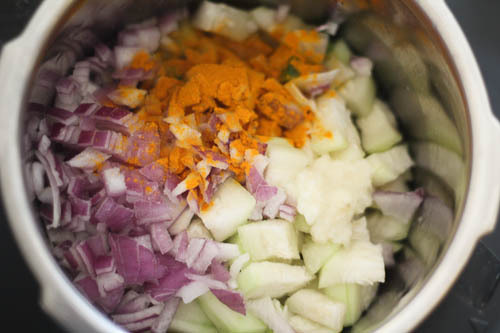 Now, let's jump on the dal recipe. Shall we? 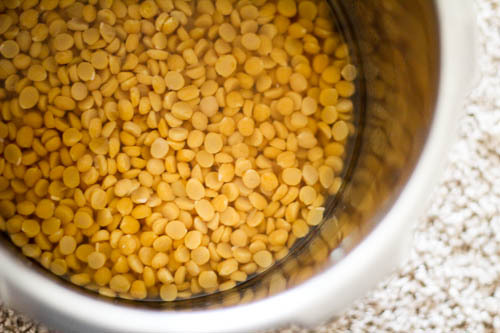 Make Ahead Notes: Let the lauki chana dal cool completely, portion into air-tight containers and refrigerate. It will stay for good for at least 4-5 days. 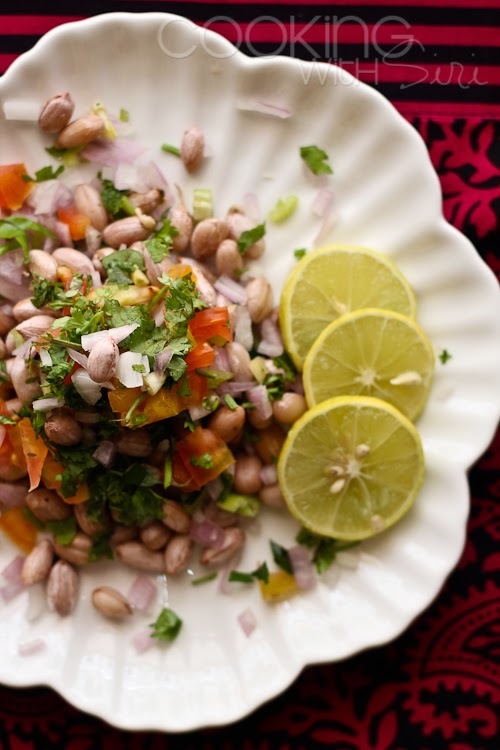 I usually make for two weekday meals - served with rice once and with roti the other time. In a pressure cooker, place bengal gram with 3 cups of water. Cook for 2 whistles. 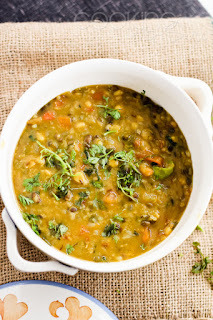 The dal will still have a little bite at this stage. We will cook it until creamy in the next step. Let the pressure release naturally. 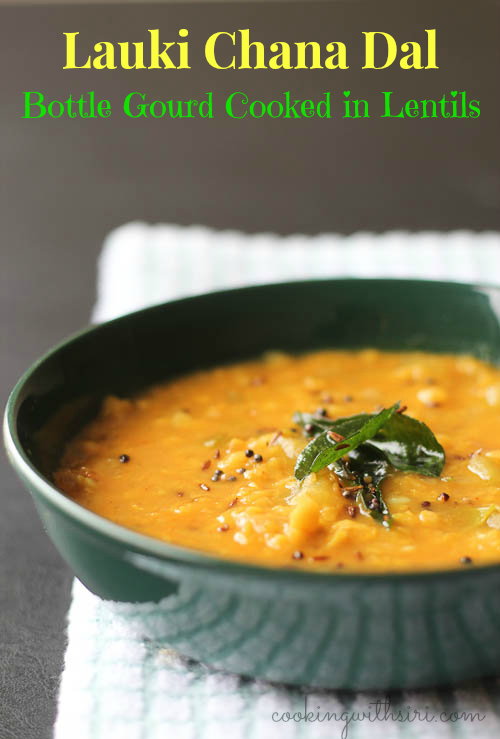 To the cooked dal, add chopped squash, ginger-garlic paste, onion, green chilli, salt and turmeric. Add 1-2 cups of water for a soupy consistency. Cook for 5-6 whistles until the dal is creamy. Let the pressure subside. Meanwhile, in a pan, heat ghee/oil. Add cumin seeds and mustard seeds. 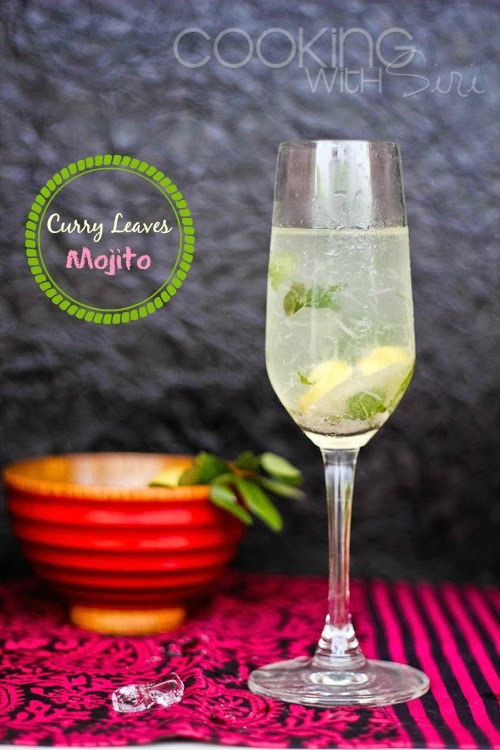 Once they start to splutter, reduce flame to low to add asafoetida and curry leaves. 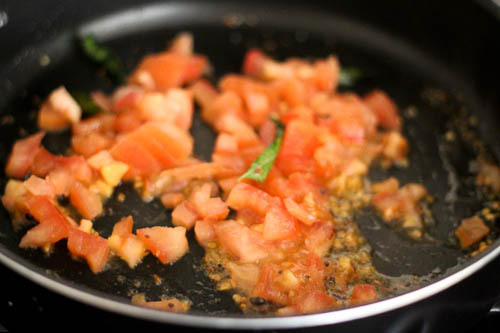 Then add chopped tomatoes and cook on medium heat until they turn pulpy. Season with red chilli powder and garam masala. Mix. Finally tip the cooked dal mixture into it. Give it a good stir and adjust seasoning. Reduce to low heat, cover and cook for 15 mins for the flavors to blend. 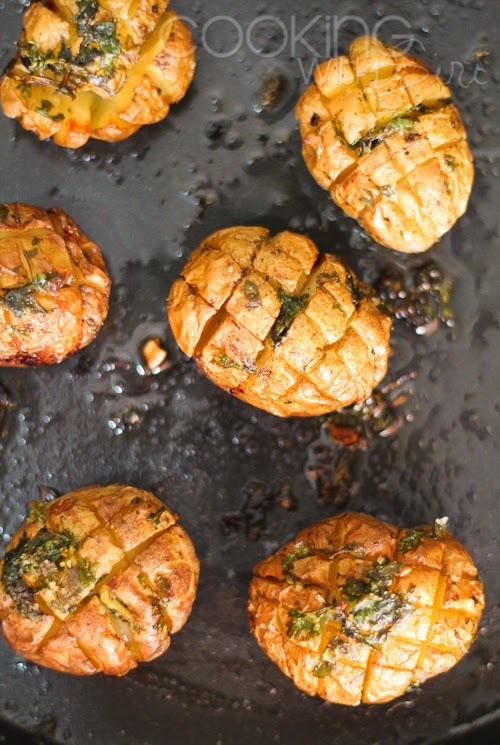 Turn off heat, add lemon juice and serve. 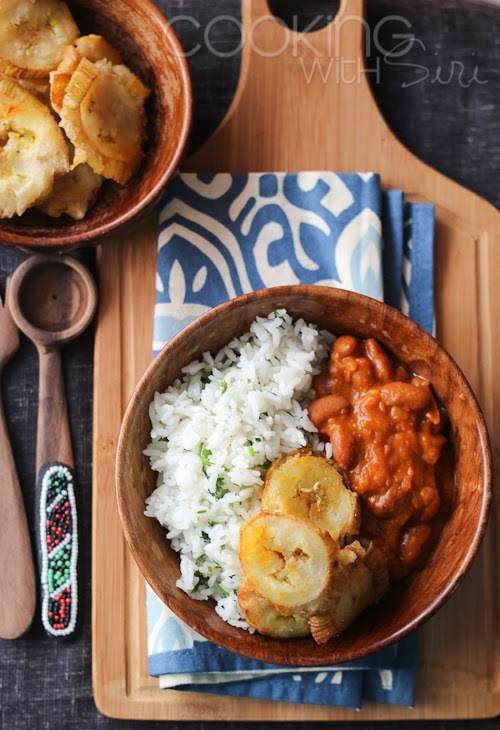 Sending this recipe as an entry to My Legume Love Affair # 96 hosted by Lisa , orignally conceptualized by Susan. That is gorgeous and just my kind of meal. I don't have a pressure cooker, but I would make it on the stovetop. Thanks so much for sharing with MLLA.